Windows Insiders got some good news this week in regards to Explorer crashing a lot. The patches are (KB3025096) and (KB3020111) and are available now via Windows Update for member of the Windows Insider program who are testing Windows 10 Technical Preview. The hotfix was announced on Twitter by Gabriel Aul who is the prominent figure for the Windows Insider program. To get the hotfix got to Windows Update and you should see it, but if not, manually check for updates. 3020396 is a small one at 138KB . Update KB3020111 is clocks in at just over 9MB and after they are installed, a restart of your computer will be required. We recently released an update for the Windows 10 Technical Preview (Build 9879) to fix an issue with frequent Explorer.exe crashes – KB3020114. We’re releasing a few fixes to the most painful issues hitting Windows Insiders on this build since we won’t have a full new build until early 2015, and we want to keep it usable for you through the end of the year. Unfortunately, as many of you discovered there was a problem that affected about 12% of PCs when installing this update, causing the install to fail. 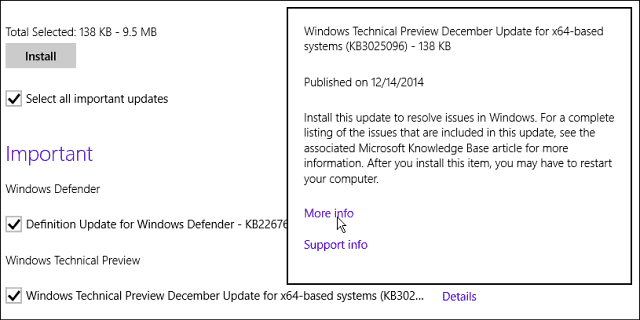 You can read more about KB3025096 Microsoft’s Support site and KB3020111 here. I haven’t noticed many explorer crashes on my test system, and after installing this update, everything seems to be running the same as it has been. I am not running it on an SSD though. Leave a comment below and tell us how these patches has affected your Windows 10 system.